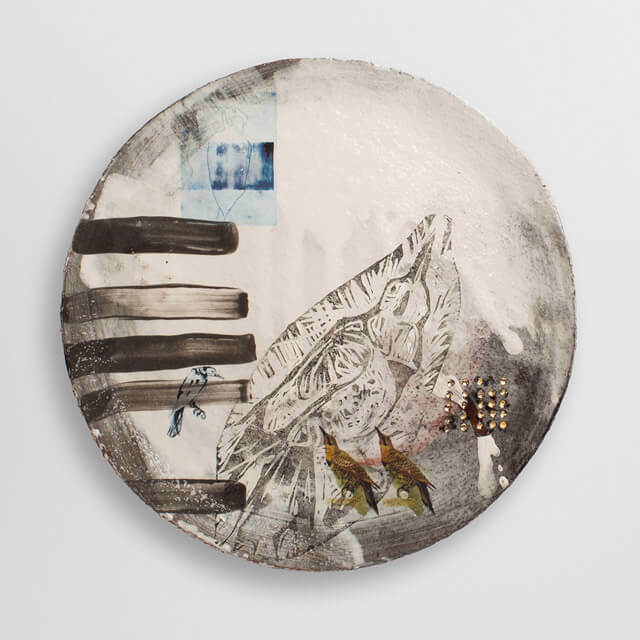 This hand-built non-functional plate is one of a series inspired by taxidermy. The artwork features a range of delicate birds in differing styles, depicted through layers of printed, painted and drawn imagery. One of the joys of Fiona’s beguiling ceramic pieces is how they reveal themselves gradually – the more you look, the more you see. This piece is one of a series inspired by taxidermy. After doing visual research at two venues with significant natural history collections – the D’Arcy Thompson Museum in Dundee and the Bell Pettigrew Museum in St Andrews – I wanted to create vessels to commemorate the animals I saw there. Earthenware, slips (liquid clay), glazes, under glaze pencil, ceramic ink, lustres and transfers made from Fiona’s own drawings. Deliveries are set by the individual designer makers and are specified on your product order email. This is the period when the seller will post your item, normally within 48 hours unless specified. If you are having an item commissioned or made to order, the designer maker will be in contact directly with regards delivery timescales. Please note the designer makers provide details of their individual delivery policies on their product pages. Our designer makers may be away at Fairs, Exhibitions or Events and they will advise directly of any delays or changes to the delivery of items. Actual delivery times may vary depending on the method of posting, carrier, etc. For further information about delivery, please contact the designer maker directly. International delivery Please note International delivery is available ON REQUEST. Please contact your designer maker for details. Delivery costs are worked out according to the product’s size and weight, as well as the destination. Please note that customers are responsible for any import charges/duties that may be incurred and must comply with any local regulations. Please note that International customs duties and sales taxes are non-refundable for shipments outside the European Community Despatch When your item has been despatched the designer maker will update the status of your order, and you will receive an automated email telling you it's on its way. Please note all UK deliveries are free with the exception of furniture and large items that are otherwise highlighted on the website. Commissioned items Please note that refunds do not apply to items which have been commissioned or made to order. Please visit our Commissions page to understand more about the process when commissioning work. Edinburgh-based ceramic artist Fiona has been crafting unique sculptural vessels for exhibition and commission since the mid-1990s. Each of her imaginatively detailed pieces is a one-off, hand built with multiple layers of surface imagery applied via painting, mono-printing and photographic transfers. In 2012 Fiona set up Cyan Clayworks, a specialist centre for creative learning and making in north Edinburgh. Fiona’s work usually focuses around specific themes, using recognisable forms to explore a range of ideas and responses. Her recent projects have been inspired by aspects of travel, tourism, souvenirs and taxidermy collections, building up a fascinating body of artwork with a wide-ranging appeal.